Several years ago I told my sister that during some upcoming time off from work, I was looking forward to getting my recipes organized. When she stopped giggling, I believe she muttered something like “well, it’s good to have goals.” I believe that was when my son was a baby. He is now in Middle School. And my recipes are currently residing in various stages of disarray in literally four different locations in my kitchen and dining room. Oh, I’ve had great intentions. At one point, I decided a binder system would solve all my recipe woes. Until I filled two binders and had far more recipes yet to categorize. Then I decided decorative boxes with dividers would be perfect – they’d look more attractive on a shelf, and be easier to keep up to date. They are each half-filled. So I’ve become a recipe hoarder. I have a large box full of cooking magazines that had a few good recipes that I meant to tear out, but haven’t gotten too. I have another bag of magazines that are waiting to be reviewed once more for anything good before being tossed. I have recipes in a pile, cut out and saved, waiting to go to a good home (binder or box or…). I have old recipes I’ve taken out to use but haven’t re-filed. I have sites saved on my iPad of recent recipes that were (ironically) quicker to look up online than find in my piles. And let’s not forget the mother ship, cookbooks. I have a bookcase full of those. Some I use frequently, some I’ve never opened. Yet I can’t bear the thought of ever getting rid of one. I know you other R.W.’s out there fall somewhere within the wide range of this maelstrom. Those who don’t cook are somewhat aghast and horrified by what I’m describing. 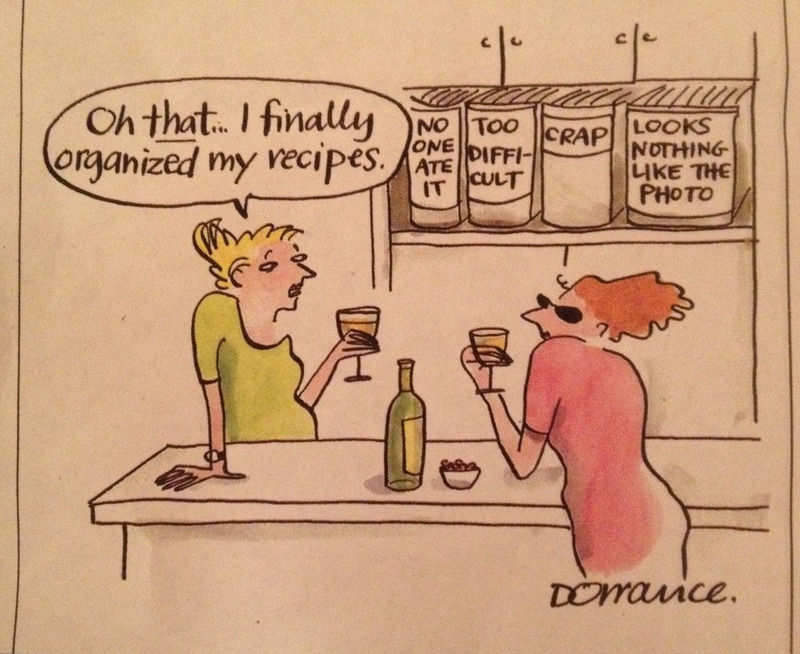 Some of you, the techy women, want to tell me to scan all of my recipes, dump the paper magazines, and go digital. Sorry, that just isn’t going to happen…. My girlfriend JUST got me interested in reading some books on a Kindle. My love affair with paper and books is too die-hard to ever give up completely. Some of you are insanely organized, everything neatly in its place, color coded and alphabetized. I have meal-planning envy of you. Then there are you R.W.’s who have a similar situation as mine. I know, because I’ve seen it. The recipes in Ziploc bags, the well-loved and folded pages of cookbooks with post-it notes sticking out, the scrawled notes written on a piece of paper and taped to the inside of the cupboard door…. We all have our “systems.” Some clearly more efficient than others. I’ve decided that my current “filing” process is actually good for me, mentally. Experts agree that as we age, we should do mental exercises and memory tests. The brain is a muscle, and if we don’t use it, we lose it. So therefore, every time I think “oh, I want to make that….” I have to remember not only where I saw that particular recipe (magazine? Hand-written card? Cookbook?) but how long its been since I last used it, and then I need to remember where I put it (binder? box? pile?). The joy in actually locating it then lessens the pain of realizing that I don’t have all the necessary ingredients on hand. Ah, well, let’s put it over there in the “want to make it next week” pile. This entry was posted in Food, housework and tagged cookbooks, cooking, files, meals, organization, recipes. Bookmark the permalink.